Our bagged cold patch asphalt material is the perfect way to permanently repair damaged surface areas in all weather conditions. Easily transported, our 50 lb. bags of material are convenient and you may use only the amount needed, resulting in less waste and mess. 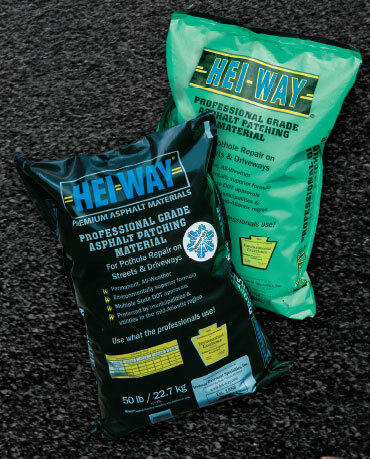 HEI-WAY® Professional Grade Asphalt Patching Material is used by utilities, public works, townships, state DOTs, federal agencies, airports, contractors and homeowners to repair and patch utility pipelines, roadways, driveways, parking lots and recreational areas. Want to try the material for yourself? Order a sample bag, which can be shipped directly to you or contact us to learn more!